Col. Robert Pavelko, 45th Space Wing vice commander, and Lt. Col. Ed Marshall, 45th Mission Support Group deputy commander, release rehabilitated sea turtles while Chief Master Sgt. Carroll Holcombe, 45th Mission Support Group superintendent, watches along the beach at Cape Canaveral Air Force Station. (Courtesy Air Force). It’s not everyday that creatures from the sea get to spend some quality time with guys from space. But even turtles need some adventure. The 45th Space Wing assisted in releasing two rehabilitated sea turtles back into their native habitat at Cape Canaveral Air Force station, Fla., on Nov. 29. The sea turtles were originally passed on to Sea World for rehabilitation after coordination with the Florida Fish and Wildlife Conservation Commission, the agency responsible for the management of sea turtles in Florida, the 45th Space Wing Public Affairs reported Dec. 4. The first turtle was captured in June by a man fishing at Jetty Park. A hook was embedded in its left upper jaw when the man pulled in his fishing line, and he turned the turtle over to park personnel. The second turtle was captured in August by a crew from the University of Central Florida, conducting a juvenile green sea turtle study for the Air Force in the Trident Basin. The turtle had a large crack in the bottom of its shell and was malnourished when captured. The Trident Basin near Cape Canaveral was chosen as the release site because it was close to their original point of capture, had low boat traffic and contained ideal food sources for the sea turtles. 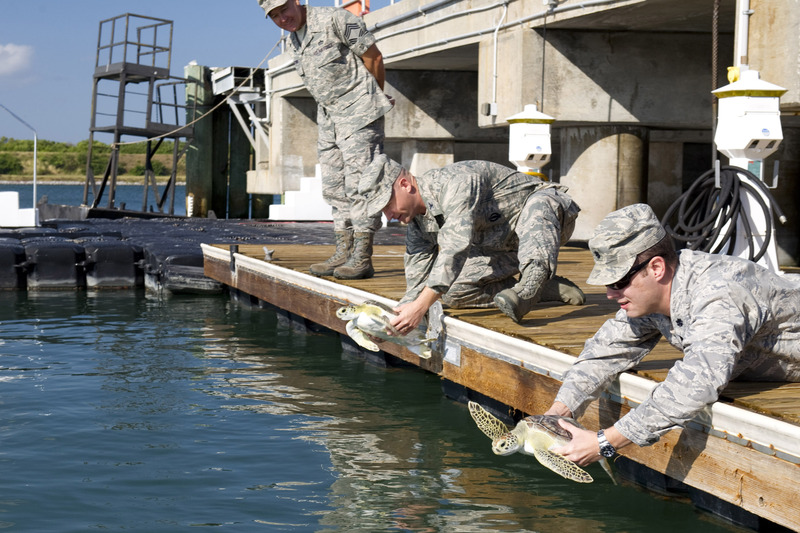 When the sea turtles were fully rehabilitated, the 45th Space Wing was contacted by Sea World to assist in release of the turtles back into their native habitat. We’re hoping their slow and steady recovery wins them a second chance.